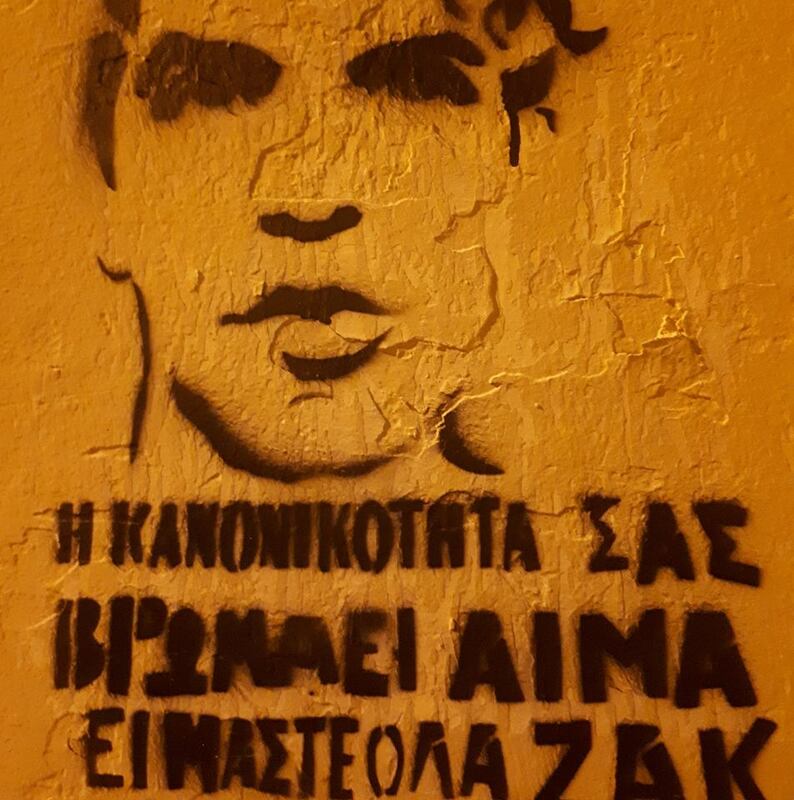 Several weeks ago Zak Kostopoulos was killed at midday in central Athens. In an apparent cover-up, local news first reported the event as a drug addict attempting to rob a jewellery store with a knife and ending up dying due to an unfortunate series of events. Zak, however, was nothing like the media portrayed him. He was a much loved gay and human rights activist. 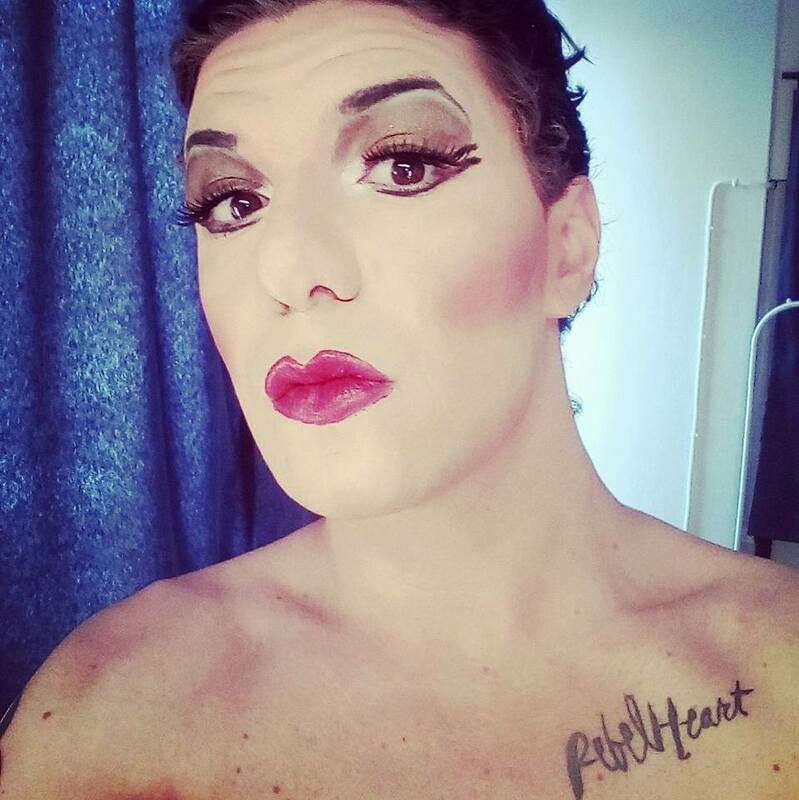 Vocally HIV-positive, a drag queen and a performer, Zac was an active member of the Greek queer community. 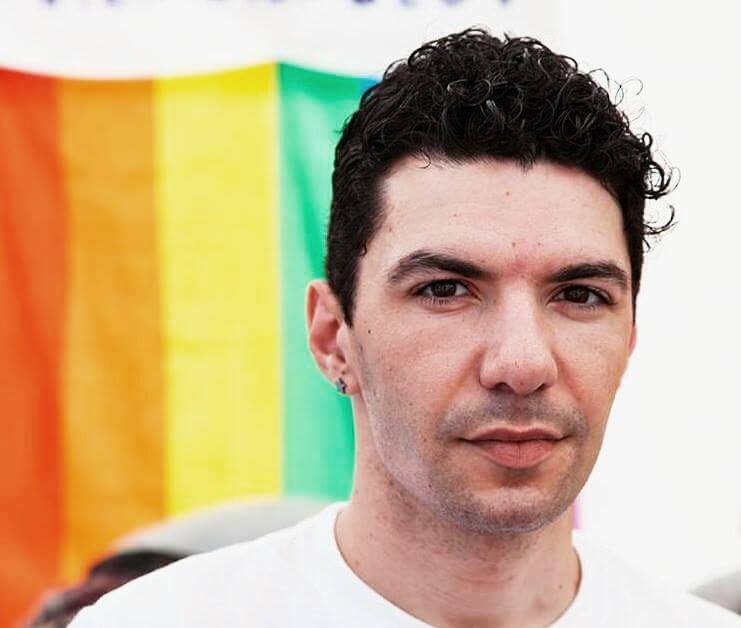 His many loving friends and the Greek LGBTQI community quickly fought the mainstream media’s attempts to brush aside his death and smear his name. Contrary to those first reports, the event looks like a murder, or as many are calling it, a “lynching”. Through videos, testimonies and people’s tireless efforts to not let another death be covered over, quite a different story has come to light. In this account Zak was mobbed and took shelter in a shop. There he was attacked by the shop owner and another man. In a telling indictment of the apathy of (Greek) society, a large group of bystanders, including two men from the emergency services, gathered without intervening as he shouted for help. They silently watched as the two attackers threw stones and objects at him, broke the shop window on his head as he tried to crawl out from the shop, and beat and kick him. When the police arrived and dispelled the attackers, the emergency services men bandaged his head. He tried to get up and get away, but the police threw him back down, tied his hands behind his back and beat and kicked him in the head. They handcuffed him as he was taken away in an ambulance. However the evidence indicates that, by then, he was already dead, and the handcuffs were nothing more than once last insult added to his lifeless body. The hard truth is that, public institutions and mainstream media are rallying around the usual party line of supporting the status quo: “property owners”, “family men”, the “normals”, while dehumanising all the rest of us. And despite the video and witness evidence, despite the statements of the attackers being full of holes and inaccuracies, it is unlikely that there will be a fair and unbiased trial. There is institutionalised support of the far-right and a long history of rights violations in Greece. In particular, the police have time and again abused their power and proven that they can get away with it. The police never sealed off the crime scene after the incident, but instead let the shop owner mop up. The second attacker was not arrested at the time, but brought in later. It has since come out that this attacker is a member of an extreme Right group. The knife Zak was supposedly holding was found days later without his fingerprints on it. The two attackers have already been set free on bail as they await trial, and the president of Police Union is unapologetic about the amount of force used during the incident. The investigation is being mismanaged, the victim is being treated more like a criminal than the perpetrators are, and the police are not cooperating with the public prosecutor. There have since been rallies, protests, talks, tribute events and film showings in Athens and other cities in Greece, as well as his funeral in his hometown of Itea. Solidarity events have taken place internationally in Paris, Berlin, Brussels and Nicosia. Articles have been published in the Greek alternative press and opinion pieces in Greek mainstream publications, and even in the french newspapers. 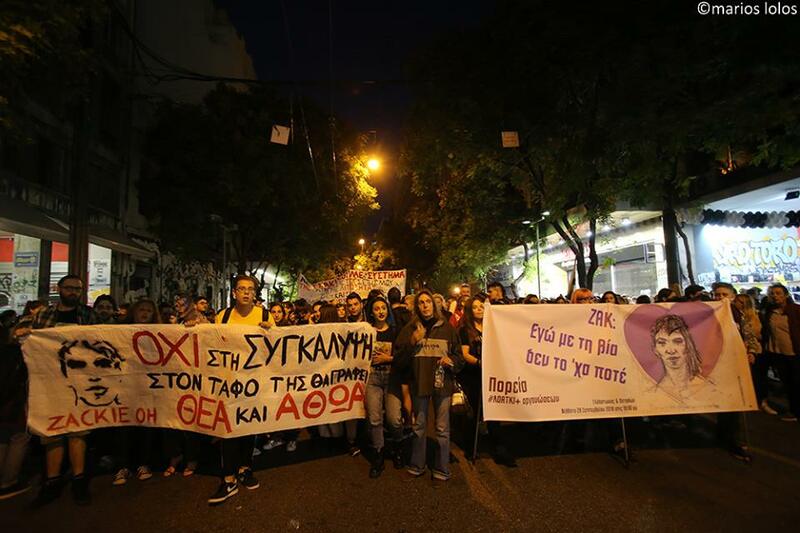 Statements of support and condemnation have been shared by university academics, students, medical professionals, lawyers, artists, journalists and photographers, Amnesty International Greece, the Hellenic League for Human Rights, the European Aids Treatment Group, ILGA Europe, the International Gay Lesbian Bisexual Transgender Queer & Intersex Youth and Student Organisation, the Human Library Organization, the Athens Antiauthoritarian Movement, the Onassis Cultural Centre, the Athens sports team “Asteras Exarcheion”, many many antifascist groups and the list is constantly growing. 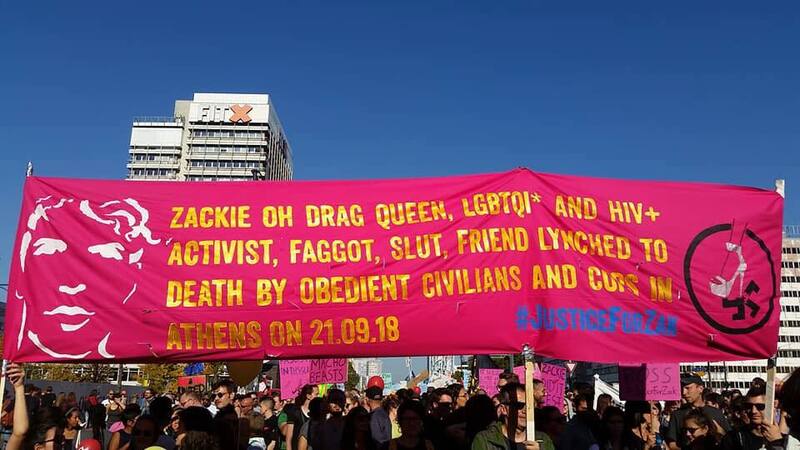 The Greek Left and anti-fascist community has largely rallied around the LGBTQI community in their fight to get justice for Zak. We have seen this kind of coordinated uprising in Greece against state-condoned violence and fascism before, after the shooting of the teenager Alexis Grigoropoulos by the police in 2008, and again after the knifing of the anti-fascist rapper Pavlos Fussas by a member of Golden Dawn (a Greek nationalist and fascist group) in 2013. Those protests however, were violent outpourings of rage and shock that turned into riots and countrywide unrest. 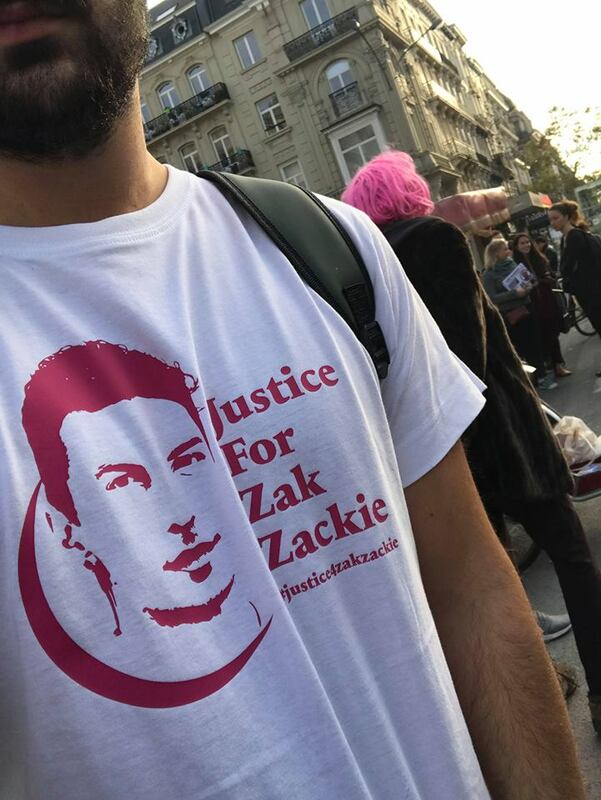 Whereas now, taking line from Zak’s own words: “I was never comfortable with violence”, the protests have been loud but peaceful. They aim to celebrate a much-loved friend’s life, ask that he be given justice and raise awareness of the issues he represented and fought for. Though the news of Zak’s death is shocking and saddening, it is not surprising. His murder was another in a long list of killings and violent attacks over the last decade (or more) against students, anti-fascists, activists, migrants, HIV-positive people, foreigners, striking workers and anyone else who doesn’t fall in line. Under a thin veneer of “modernism” and “liberalism”, Greek society still hides violent fascist and patriarchal undercurrents. These have been stirred up and allowed freer reign in the aftermath of the economic crisis and the subsequent institutionalised deconstruction of society that has taken place under the banner of austerity. Violence against women, children, queers, migrants, minorities, and other oppressed and disenfranchised groups, is an unspoken fact of life. Being queer or otherwise “different” is more than an act of self-expression in countries like Greece, it is an act of defiance and extreme bravery, a decision to spend the rest of your life as a battle. A battle not only to be accepted, but sometimes even a literal battle to be allowed to live. This a battle that Zak fought well, but ultimately lost. Let’s not be part of the silent complicit crowd. Let’s raise our voices in support.